Fyodor Dostoevsky has been considered as one of the founders of twentieth-century existentialism and by saying that I can hint that this short story is also an 'existentialist' work. 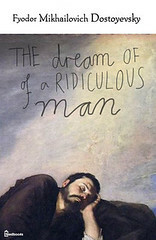 'The dream of a ridiculous man' may be among the first works of existentialism along with Dostoevsky's 'Notes from the underground.' In this story, Dostoevsky describes a dream, that the protagonist of this story had and via that dream, he expresses his views on philosophical questions such as why do we exist or what is the purpose of the life. Central to the objective of this story is the thought that has gone to the questions like what has happened to humankind and why did that happen. Divided into five chapters, this short story is a tale of a man who is devoid of any purpose in life and decides to end his life. Then he dreams something which changes the whole narrative of the life for him. In the earlier chapters, Dostoevsky describes the condition of the protagonist in which he knows many things and because of that, he is in a state of bliss. He says that he need not explain that to anyone because no one will understand. This theme can be found in other writers of the 'existentialism' genre such as Jean-Paul Sartre and Albert Camus. In their works also, we can see that protagonist wonders what others are doing and does that have any meaning. As for as the purpose of the life is concerned, there have been philosophical questions such as if there is no purpose of life, should one end it. If the whole universe is devoid of any meaning should one commit suicide? Albert Camus has addressed these questions in his now phenomenal work 'The Myth of Sisyphus.' In 'The Dream of a Ridiculous Man', Dostoevsky has described that even a small incidence might force a person to think about his existence and find the purpose where there was none to start with.